4Videosoft DVD Ripper is able to convert DVD freely. You can rip DVD to the popular videos like MP4, MOV, M4V, AVI, FLV, MPEG, MOV, and more. And you are able to convert DVD movies to HD movies with the best quality. 4Videosoft DVD Ripper provides you with splendid editing functions like effect, trim, crop, watermark, merge functions to optimize the output videos. 4Videosoft DVD Ripper is able to convert DVD movies to MP4, AVI, FLV, MOV, MKV, etc. And the output video are able to play on your portable devices such as iPhone 5S/5C, iPhone 5, iPhone 4S, iPad Air, iPad mini 2, iPad 4, iPod touch, Samsung Note 3, Samsung Galaxy S5, HTC one, Nokia Lumia and BlackBerry and so on. This DVD Ripper can also help you convert DVD to HD movies if you like. And you are able to extract audio to MP3, AAC, M4A, AIFF, WAV and WMA and other popular audio formats. You are able to optimize your video with the powerful editing functions. You can adjust Brightness, Contrast, Saturation, Hue and Volume. 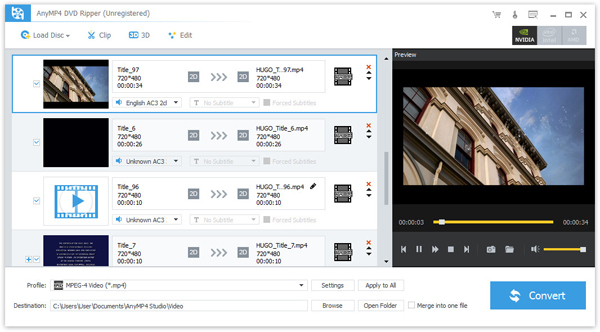 And you are allowed to trim video length, crop video frame and add text and image watermark. Also, you are able to merge two or more videos into one. With this powerful DVD Ripper, you can choose audio track and subtitle as you like. This DVD Ripper enables you to preview your videos and take snapshot as you like. And the pictures can be saved as default folder with this powerful DVD Ripper. You are able to finish your conversion with high conversion speed and quality.